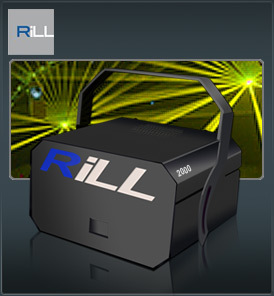 The RiLL saffron 2000 is our high powered big brother to the RiLL Saffron 1000 a Class IV 4 colour multicoloured laser projector producing beautiful and bright red, green, yellow and orange laser light. The RiLL saffron 2000 produces undoubtedly the brightest purest yellow light with a myriad of colours in between due to it extraordinary red diode outputting at 1000mw, couple this with its high powered 1000mw green and it is clearly a class leader In multicoloured laser light technology. Put the RiLL saffron 2000 together with the PM 2000 laser controller and be amazed at how vivid and seamless the mix of colours is. Couple this with its indoor power and outdoor capability and then you will only start to understand this awesome laser. The RiLL saffron 2000 the future has only just begun. [read more...] The PM2000 additionally has support for traditional laser display oscillator type effects. The oscillation engine is very advanced when compared to "stand alone" desks of the 80's. Using the calculation power of the PC's internal processor - An unlimited number of effects can easily be obtained using the oscillators. If you combine the oscillation engine with the modulation engine, you'll be absolutely amazed at what you can achieve!